Three stands for that which is solid, real, substantial, complete, and entire. There are three great divisions completing time--past, present, and future. Not exactly the Rangers of this season. Luck is also said to 'come in threes', which is precisely what our defense relied on as The New York Rangers beat the New Jersey Devils tonight in a shootout at MSG, 2-1. With a little bit of luck our defense held the Devils scoreless in three power play opportunities to extend their current streak to 19 consecutive successful penalty kills. Not bad on paper; so why does it look so shaky? Our confidence tonight may have come in the form of a particular Swedish goaltender named Henrik Lundquist, the Rangers superhero. Our 'King' stopped all three shots in the shootout, turned aside 28 of 29 shots in regulation/overtime to record his third consecutive win and sixth of the season. Scott Gomez scored the lone Rangers goal in regulation during the first period, his first against his former Devils teammates. During the shootout, The Dark Ranger's favorite Petr Prucha froze New Jersey goaltender Marty Brodeur, with a chip-high shot and score - a chin low moment for 'New Joisey Devils of Newark' fans. Marty, Marty, Marty!!!! Hah. The New York Rangers are now 6-6-1, looking to take on the Atlantic Divisions leaders, the Philadelphia Flyers on Monday night. This will be the first official meeting for former Buffalo co-captains, Ranger's Chris Drury and Philly's Daniel Brierre. 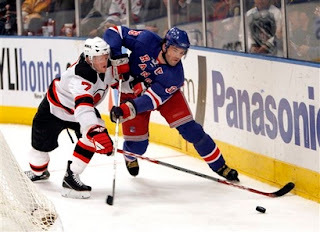 I wish I could say that droopy Drury is playing at the same level as Dancin' Danny Briere, but there have been improvements with the Rangers front lines - they are connecting, still conservative, but playing toward the net more than games past. Tune in folks, as the first division meeting of this NY Rangers-Philadelphia Flyers rivalry is always a bloody one. With Philly currently in first place, superior level of play this season and the New York Rangers on a run, three for three, the Blueshirts will be looking to take their game to a new level on Monday night. Look for Jagr to actually drop his gloves! LOL. Look for Jagr to drop his gloves??? Maybe to pick at a hangnail or run his fingers through his hair. LOL. You passed the test! Wanted to see if anyone was paying attention. dArk, I read it earlier thinking you must have been drunk at the game -- by the way, Jags ignored me at the Whiskey Park after the caps game last week, I think Prucha was with him - i had nice things to say and he shrugged and ignored me. Talented-yes. Prick-yes. dj-i bet most of these guys are regular guys off the ice...maybe he had a bad night. I heard that Jagr might be out for the Philly game with a groin strain. There is a joke in there somewhere ... hmmmm. No matter if he is in or out of the lineup, tonight should be good to watch Eager and Avery go at it. Let's Go Rangers! 2) Can Lundqvist play 75+ games this year? He may have to for the rangers to get into the post season. faux...he says he WILL play all games in season -- which boosted his fantasy rankings up 20 notches. He is so damn good...keeping this team alive. scotty...The Dark Ranger is NOT for sale. lol. Oh and he's the only player worth a damn On my fantasy team right now.